Yom Kippur, the Day of Atonement, follows Rosh Hashanah. On this day, we fast and pray for our correction. One of the most meaningful parts of the day is the reading of the Book of Jonah. It is with good reason that this part of the Yom Kippur service is so significant. The Hollywood-style storyline of the book contains a message that if heeded, can lift humanity from the global sludge we seem to be submerged in and brighten our future. 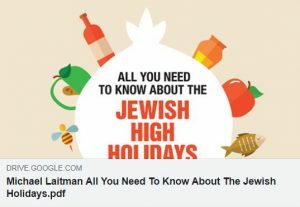 Here is a short booklet about the High Holidays that I hope you will enjoy reading. Please also feel free to print it out and distribute in your community. A ten is all that exists in all of reality, in all the worlds. All of creation, which has evolved from the four stages of direct Light, is called one “ten.” Malchut of the world of Infinity, in which there are ten round Sefirot full of infinite Light, is a ten. There is nothing besides it. And the Creator is the Light of infinity filling this ten, Malchut. Then this system of ten circles, the Sefirot, undergoes all sorts of changes. The program of creation transfers this ten from a round complete state into a fragmented one. As if to calculate the integral when the continuous surface is divided into an infinite number of squares, the system of ten “circles” is broken to divide the work between multitudes of people, between all parts of the system, so that everyone will complete his or her private work and become similar to the Creator. After all, one cannot do all the work right away in one go. 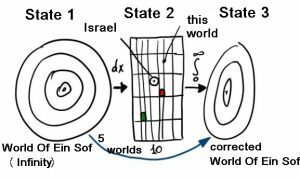 The system is transformed from an “integral” to a “differential,” in which the work is performed in parts. Ten stages of work are distributed among the five worlds and are additionally divided more and more. Each of us performs some kind of work in his cell. As a result, all parts of this work are integrated again, combined into one integral work, like an integral from zero to infinity. All these breakages, contractions, and descents are made in order to give each fragment its infinity in its completeness from its individual properties. In the first state, it was impossible to do it because we were all interconnected in an integral, infinite form. It is impossible to shatter the created being that is opposite to the Creator so that it can attain the Creator from its opposite, antagonistic state and leave it “round.” After all, the circle is already perfection, a smaller or a bigger Creator. Therefore, it is necessary to break this circle to give each fragment different properties, sides, angles, that is, restrictions. Now, from these restrictions, one must begin to attain eternity, perfection, integration, connection of all with all. This gives a feeling of the Creator and true perfection. It is impossible to get into the third state bypassing the second, the shattered one. This is all our work. It is necessary to strive to get from state 1, through state 2, to state 3. Correction begins when a ten is organized and appears in front of us. That is, the correction began from Abraham, and now each of us at some point falls into a place where he has a ten. This is how the advancement toward the integral, true system of the upper force begins. A person does not only know how to conduct actions. He understands where they stem from, why they are this way, what their internal mechanism is, and thus, this attainment obligates him to perform actions. He becomes smarter and doesn’t do anything without a reason, but searches for the root and the cause. This is “above reason,” meaning rising to a higher reasoning, and it is called “the view of the Torah,” when a person searches for how to activate the Light in which the mind and force of the entire creation can be found. The mind is simply there to serve our egoistic desire, helping a person seek pleasure and avoid trouble, like an animal. Also, if a person understands that he acts within his egoistic desire and is unable to rise above it, then he wants, unlike an animal, to attain the mind of a human, Adam, that is, to be similar to the Creator. He then begins to act not for the purpose of fulfilling his desire for pleasure, but to become similar to the upper force. 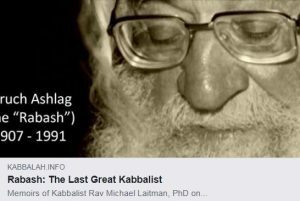 This is how I came to meet my teacher for the first time, Rav Baruch Shalom Ashlag (the Rabash), the eldest son and successor of Baal HaSulam—the greatest Kabbalist of the twentieth century. From that moment on my life was never the same. For the next twelve years I served as his personal assistant and disciple, and I absorbed from him everything that I know in the wisdom of Kabbalah. Every day he would lock himself up on the second floor and write. This is how his profound articles were born, which paved the way for anyone nowadays to carve the spiritual path most suited to them. No one before him had written in such a simple and practical manner. Like a father who guides his children along the path, he takes his readers by the hand and guides them until they discover the true meaning of life. “And once I have acquired the clothing of love,” he wrote to his students at the end of the well-known letter “Love of Friends,” “Sparks of love promptly begin to shine within me. “The heart begins to long to unite with my friends, and it seems to me that my eyes see my friends, my ears hear their voices, my mouth speaks to them, the hands embrace, the feet dance in a circle, in love and joy together with them…” (the Rabash). After his departure in 1991, people who felt a burning desire in their hearts to reveal their purpose started coming together. Gradually, the Bnei Baruch Kabbalah Education & Research Institute was formed, named after Kabbalist Baruch Ashlag. 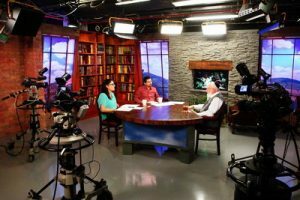 Every morning we study the writings of the Kabbalists, such as The Study of the Ten Sefirot, The Zohar with the Sulam commentary and the writings of Baal HaSulam and the Rabash. We work to share the method with anyone interested, just as my teacher gave me the wisdom of his father. This evening marks the 27th anniversary of the passing of my teacher, the Rabash, the greatest of the generation. I hope that we will succeed in following his path faithfully. Love is a result of respecting the habits of others more than my own and conceding for the sake of connection. Disrespect deletes and harms the other. It destroys the confidence of children who need to be trusted to exist independently at times. Absolute love, on the other hand, leads to disrespect and even hatred. Relationships based on shared obligations are also difficult to hold together. The ironclad rule is “love covers all transgressions.”. In spite of differences, we concede during communication, we speak only about positive things, we think constantly about how we can express love toward the other. and we explain that we expect reciprocity.